The number one thing changing is our meeting space at TAF. Come April, the Tippecanoe Arts Federation will be closing for a whole year to renovate the building. That means that SAMI will be assigned a to-be-announced, alternate meeting space. Until then SAMI still has use of the Fiddlers Room in the lower level of TAF if we choose to use it. Because of the TAF closing and declining number of people coming to meetings, a few questions arise: Do we want to redesign the SAMI meeting? Are people wanting something different than what is currently offered at the monthly meetings? Can we offer songwriters something to entice them to be more involved? The mailing list is approaching 160 people, but only a handful of people have been showing up at meetings, and no one wants to fill the empty board positions. Why is this? How do we get more people involved in our group? In effect, where should SAMI go from here? The Songwriters Association of Mid-north Indiana was founded as a resource for the purpose of education, encouragement, networking and development of songwriters in mid-north Indiana. Through the means of workshops, showcases and monthly meetings, SAMI has sustained growth through the unselfish support of area musicians. Our meeting will be in the Fiddlers Gathering East Room on the lower level of TAF. Come join us and get the latest news and share a song. 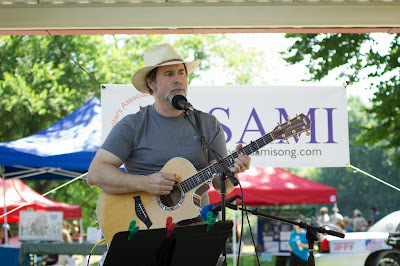 At our July meeting, Frederick Michaels shared lyrics and invited people to add the music. Not one, but TWO people took up the challenge. Come to the meeting to hear both (very different) songs shared by Lee Anna Atwell and Gilbert Gordon. Don't forget to "like" SAMI on Facebook and post your upcoming gigs and share what's going on with you. See you there Tomorrow (Tuesday) at TAF! Our regular song-sharing meeting will be in the Fiddlers Gathering East Room on the lower level of TAF Tuesday, April 18th. Come join us and get the latest news and share a song! Did You Sign Up to Perform at Riverfest on July 8th? We will have the signup sheets for Riverfest for morning or afternoon slots. So far we only have a few people and we need others to fill the day. Don't forget that it is a fun, easy "plug in and play" opportunity on July 8th. Slots range in length from 2-3 songs to 6-7 songs depending on what you'd like to sign up for. See you tomorrow night at 7:30! What- Currently accepting applications for the 2017 Shirley Martin Scholarship for Young Songwriters, which includes the special Mike Lane Horizon Award. This scholarship and award exists for the purpose of developing, recognizing and supporting area youth in the advancement of their songwriting skills. When- Applications being accepted until March 31, 2017. Distribution: Winners will be notified on or before May 1, 2017. For additional information email TJ Rosa at tjrtunes@gmail.com. Officers for 2017: We are soliciting so whoever is interested in participating in a SAMI position for 2017, please make this known by emailing secretary@samisong.com. Your service is appreciated. All emails must have “Name - SAMI Songwriter Showcase Audition” written in the email subject. Songwriters will be notified via email whether they are selected to perform in a showcase or not. SAMI Songwriter Showcase - email nickyroodmusic@gmail.com to apply! Funndraising DVD of the Jan 9, 2016 House Concert at the Delphi Opera House has been released and is available for purchase, $20 for both the DVD and CD combo package. All proceeds go to SAMI if you purchase from SAMI and all proceeds go to the Delphi Opera House if you buy from them. This is a really good concert and it supports 2 worthy causes. 2017 Shirley Martin Scholarship for Young Songwriters: Stay tuned for updated deadlines and ways to help with this year’s songwriting scholarships. Barrett Myers and TJ Rosa will be coordinating to get the ball rolling, and more info will be coming on how you can help. The colder weather means more time spent indoors...might be a good time to start a new song. See you at the February meeting. We will meet in the room next to the kitchen on the lower level of TAF. Get the latest news and share a song!